On Saturday about 250 people protested in solidarity with Afrin and Rojava, and against arms manufacturer Rheinmetall in Düsseldorf, Germany. Rheinmetall headquarters are in the capital of the German state Nord Rhine Westphalia (Düsseldorf). A reportback. As I arrived at the starting point of the demo I was a bit dissapointed. About 150 people showed up. I was happy to see that about 100 more joined us when we started marching but still… 250 people is not a lot. Its not long ago that we were able to mobilize in the thousands for demos in solidarity with Afrin and Rojava. 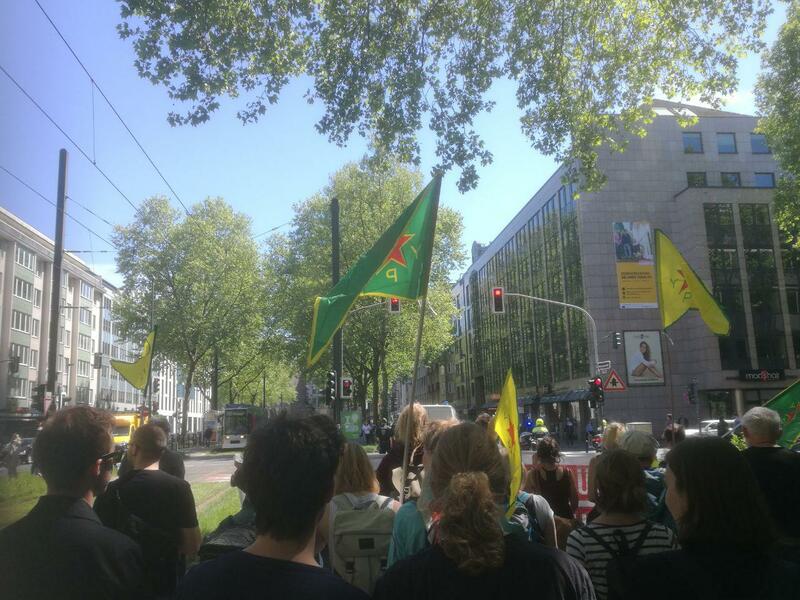 The demo started loud “German weapons out of Afrin, shut down Rheinmetall!” The cops allowed YPG and YPJ flags (image above) at the demo, something that they often don’t do. Many other demos were stopped and dissolved by cops in the German state of North Rhine Westphalia in the past because of YPG and YPJ flags, or flags with a portrait of Öcalan. The cops also didn’t march on both sides of the demo, so people were able to spread a lot of flyers to passersby. Many people who live in Germany know that German corporations are selling arms to the Turkish army and disapprove the support of the Turkish war of aggression in Afrin by German corporations and the German government. After a march of about 90 minutes the demo reched its’s final point. We reached a lot of people in Düsseldorf and that was good, but still… I was dissapointed. The cops sabotaged the mobilization for the demo. A few days before the demo the cops suddenly demanded that the demo had to start 11:30am instead of 01:00pm. But I don’t think that was the only reason for the dissapointing turnout. It seems that many people are easy to mobilize during a “hype.” But when the mainstream media stop reporting, we are not able to mobilize anymore. So we have a lot to talk about. How to improve the spreading of counter information and how to set our own agenda’s? Its one of the reasons the Enough is Enougfh collective is not only an online project anymore. We are working hard to renovate the spaces of the Enough is Enough info café. To discuss issues like the one above offline, with people instead of vicknames and avatars. That alone won’t be enough but we think it’s a step in the right direction.